An anti-fracking protester let fly with a torrent of abuse as he stood outside the shale gas wearing exploration site. Knox, of Dugdales Close, Blackpool used goading gestures with his arms as he stood in the middle of the A593 which runs past the site at Westby with Plumptons. Knox was found guilty after a trial before District Judge David Purcell at Blackpool Magistrates. He was convicted of using threatening words and behaviour and was ordered to pay £650 in fines and costs. The security officer gave evidence during which he denied wearing a black balaclava to avoid being identified by protestors. He said: “I know Knox and saw him arrive on his bike. “He went into the middle of the road and started shouting at me. “He was provocative and I feared violence might follow. He denied a suggestion by defence lawyer Adam Bonney that he had started the altercation by calling Knox a ‘scruffy tramp’ and telling him to find employment. A 16 minute video of Knox’s arrest was shown to the court. Knox repeatedly claimed he had been singled out for arrest. Sentencing Knox the judge told him: “To some fracking is an answer to our fuel needs, to others it is regarded as a threat to our environment. “There is a right to peaceful protest and people should be allowed to get on with their jobs without fear and abuse. A 20-year-old man became besotted with the first love of his life. Dailen Royle admitted breaching a restraining order by bombarding the woman with texts and voice mails. The restraining order only had a few weeks to run when Royle of Pickmere Avenue, Marton, started trying to contact the 25-year-old. He had breached the order twice before, the town’s magistrates were told. Steven Duffy, defending, said that Royle could not get over the fact the relationship was over. “His mother said he was completely lovesick for her and the mother also believed the relationship was toxic,” said the lawyer. Although none of the tests - some fired at her at the speed of one a minute - were threatening, it revealed Royle was obsessed with her. They had got back together for a time and she was now carrying his child, said Mr Duffy. His victim told police that she was scared and anxious that Royle would turn up at her home. Royle was given 56 days prison. He must pay £85 costs and £115 victim’s surcharge for what magistrates said was his complete disregard for the law. A homeless Blackpool man has admitted breaking the terms of his criminal behaviour order. 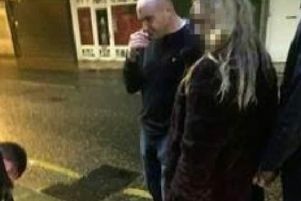 Mark Sowerby, 39, currently of no fixed address, has been barred from the central area of Blackpool because of his persistent begging. He was arrested when police saw him in Abingdon Street. He told officers that he was gong to collect his clothes from a friend’s flat. Sowerby was given a 12 months conditional discharge after he admitted the offence. A Blackpool man travelled to another seaside resort to carry out crime. Mark Hindley, 29, of Adelaide Street, went to Morecambe to shoplift to raise money to pay for drugs. He stole a set of hair straighteners from a stylists and 30 packets of ham worth £60. He admitted the thefts and also breaching the terms of his probation order by not reporting to his responsible officer. Paul Robinson, defending, told magistrates: “He has got a problem with heroin. Hindley was given a 12 month conditional discharge. He must pay £225 compensation to the shop owners and £70 court costs.